Soon, Seattle will have its one week of spring followed by a long, hot, dry summer (such is the new 'normal' in the climate-changing world). As I gear up for warm weather, I start to test citrus-y Eaux de Cologne, looking for refreshing, sparkling, natural-smelling perfumes to wear when the going gets sultry. These fragrances need not last longer than 10 minutes: I use them most right out of the shower (before putting on a stronger perfume) or at bedtime (when long-lasting fragrances are verboten). ...a light, fresh and dynamic fragrance, a 'feel good energy giving' scent. The bottom note is based on the original perfume Eau de Parfum with added citrus fruit and flower based fragrances. The underlying Amber gives it weight and strength. Finally comes the bouquet of freesia, magnolia and rose flowers. Right out of the bottle, Eau de Cologne smells fizzy-fuzzy, a lightweight, citrus-infused amber. Up next, is barber-meets-medicine man in character, a mix of spicy-herbal, bay rum and clove-y aromas. If you tried Comme des Garçons Eau de Parfum you will recognize the kinship between cologne and parfum. What was "adult-strength" syrup is now diluted to create a child-safe tincture. I wore original Eau de Parfum but can't say I enjoyed it (I appreciated it); I like this lightweight version better. As Eau de Cologne dries down, I smell faint, smoky sandalwood and a vegetal-floral musk. On me, Eau de Cologne wears more like an Eau de Toilette. If you're the type who goes into amber withdrawal in spring and summer, give this sheerer version a shot. Eau de Cologne's extreme dry down reminds me of the comfortable/cozy scent of wool sweaters and scarves that have held on to rich, oriental perfumes. Eau de Cologne does not fit my Eau de Cologne sweet spot (it's too strong and long-lasting), but I can see wearing it as a fragrance day or night, dressy or casual, in any season. 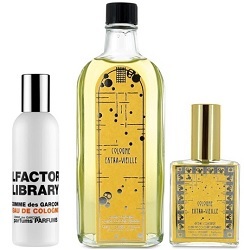 Comme des Garçons Olfactory Library Eau de Cologne is $95 for 50 ml. Oriza L. Legrand is a favorite perfume house of mine (and I'm addicted to their soaps) and that's why Cologne Extra-Vielle* is a major disappointment — it screeches in a vile synthetic language you'll recognize from cheap shampoo and conditioner scents found at the Dollar General store; that's fine if you're paying a dollar for this cologne, not so fine to pay almost $200 for it. Every fragrance note is stunningly ugly...I could not wait to wash it off. Oriza L. Legrand Cologne Extra-Vielle comes as a set: each set includes a 250 ml splash bottle and a 50 ml (refillable) spray bottle (you get 300 ml total for $195). * Fragrance notes of bergamot, lemon, rosemary, bigarade, orange peel, orange blossom, citron, neroli, lavender. 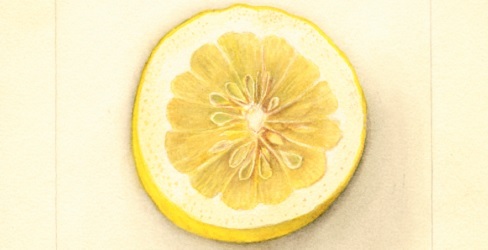 Note: top image of Citrus limon: Corsican [cropped] by Deborah Griscom Passmore, 1840-1911, via USDA Pomological Watercolors. SheWolf: you know, I love all the Guerlain Eaux de Cologne, especially Eau de Cologne Impériale. I wear Eau de Rochas often…I wear Hermes Eau d’Orange Verte and Pamplemousse Rose…I could go on for days! Chanel’s Eau de Cologne is nice, too. SheWolf: forgot my favorites: Astier de Villatte’s line of colognes…love ’em all. I should say, I was a bit surprised they called this a cologne because it doesn’t strike a refreshing note. Coumarin: agree…not a ‘classic’ cologne by any means…but really good. The CdG cologne sounds interesting but there is something so confusing about that line (at least the non-series, non-designer-collaboration parts of it). I’ll never get those scents straight in my head, or feel certain that I’ve tried them all, or that I understand which one is the subject of a given review. For example, is there really a masculine and feminine of CdG 2, or just different different special bottles, and, if so, which bottle is which? I think I’ll stick with Astier de Villatte! They do such intriguing variations on the theme, and I love some of the names. Noz: the CdGs ARE confusing in the “basic” line…I think I’ll treat myself to an Astier de Villatte cologne for summer…hard to decide. I like the Roger et Gallet Extra Vielle/Jean-Marie Farina scent, as well as Eau de Fleurs de Cédrat.